We have come to our third guest post. 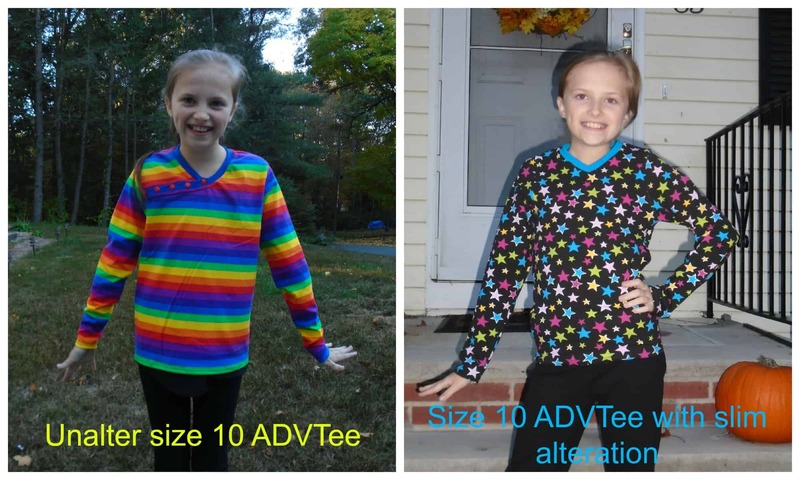 Heather from Boutique Birdie will show you a great way to adjust your pattern to fit your child perfectly! She actually uses our newest pattern for this: The ADVTee. In her post she shows you the simple V-neck option. The pattern will release coming Friday….. Just like the last two posts though we will host a giveaway. So check out the raffle copter below and try to win the ADVTee before it’s release (pattern will be send to you Friday). On to Heather…. Thank you Anne for allowing me to be a guest on your blog today! Today I will be explain how I make slim alterations to my Sofilantjes patterns. My oldest daughter has always been on the slim side. As you can guess, this can make things a bit tricky when buying and sewing clothes. We either end up with necklines too big and pants cinched up as much as possible or end up with sleeves and pants that are too short. 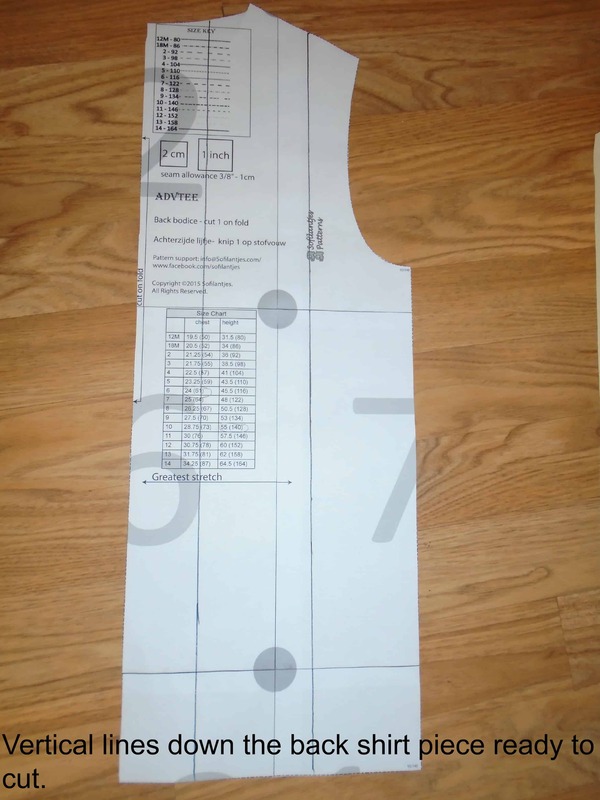 I was very glad to see Sofilantjes include directions in the Brueram dress pattern to make slim or plus size adjustments. That was the first time I had used this method and it was a big success. Since then this method has been my favorite for adjusting patterns to fit my daughter. The pattern I am working with is the new pattern called the ADVTee that will be releasing soon! Here are my before and after pictures. The rainbow striped shirt on the left is before the alterations. As you can see the pattern is very wide on my daughter but the length is perfect. The picture on the right of the shirt with the stars is with the slim alterations. The tee-shirt fits her so much better but kept the length she needs. Even though the neckline is a different style this is the same pattern. Now let’s get started. The first thing you will need to do is measure your child. Once you have properly measured your child, take your measurements and compare them to the size chart. My daughter is currently 55” tall and has a 23 ½” chest. This puts her in a size 10 for height and a size 6 for her chest. You will now need to print two copies of the pattern, one for each size. I like to print off both sizes at once with the layers feature and then trace off the sizes I need. That way I have an original copy of the size I am altering to refer to as a reference if needed later. 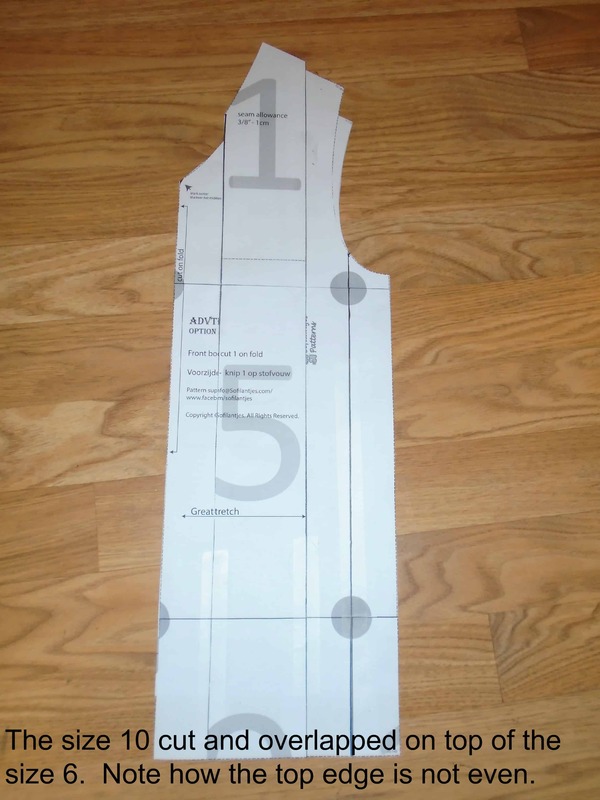 Now before we begin altering the pattern I want to note one important thing….once you start adjusting one area, you will also need to adjust all areas that are sewn to that area! For example, if you adjust the front bodice of a dress, the skirt will have to be adjusted too. If you adjust the neckline area, the neckband will need adjustments. Next you will cut the pattern in three pieces along those lines. 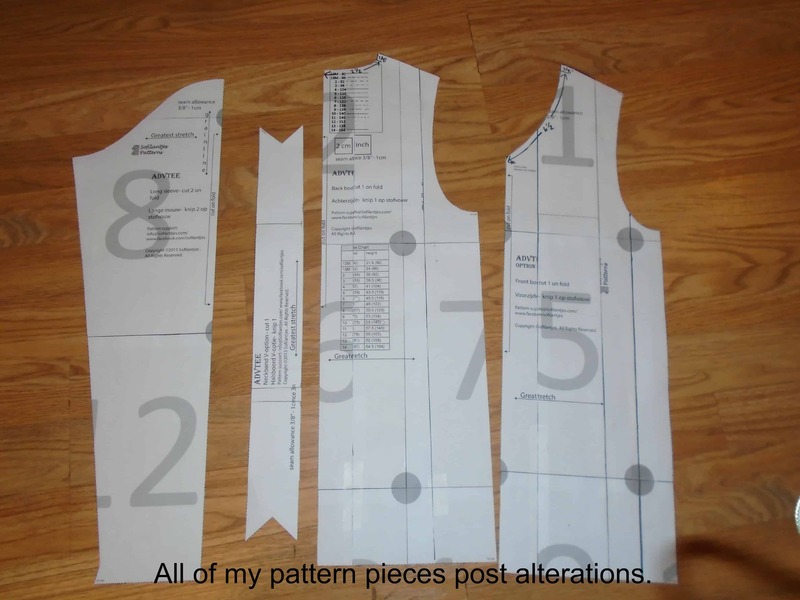 Once your pattern is cut you will arrange them on top of your smaller sized pattern piece, in my case the size 6. I used the bottom edge of the size 6 to make sure everything was squared off on the bottom. I kept the overlap the same between the pieces. As you can see my top edges don’t exactly match up. I use my unaltered size 10 pattern piece to even them up being careful not to make any changes to the armscye. Congratulations, you have successfully altered the front of the shirt! Next grab the back shirt piece and essentially do the same thing you did for the front. One thing to double-check is that your shoulders are even when adjusting the back piece. Even out the top pieces of your pattern and set them aside. As I mentioned before, if you adjust one part of a pattern you will also need to adjust all the other pieces that are sewn to that piece. This means we will also need to adjust our neckband. To do this I compared the measurement of the unaltered neckline to the neckline of my new neckline. Then I use a little math and decreased my neckband to stay in proportion to the orignal. Now you have all your pattern pieces ready to go. Since I did not alter my armscye, I do not have to alter my sleeve. I will cut the original size 10 sleeve. 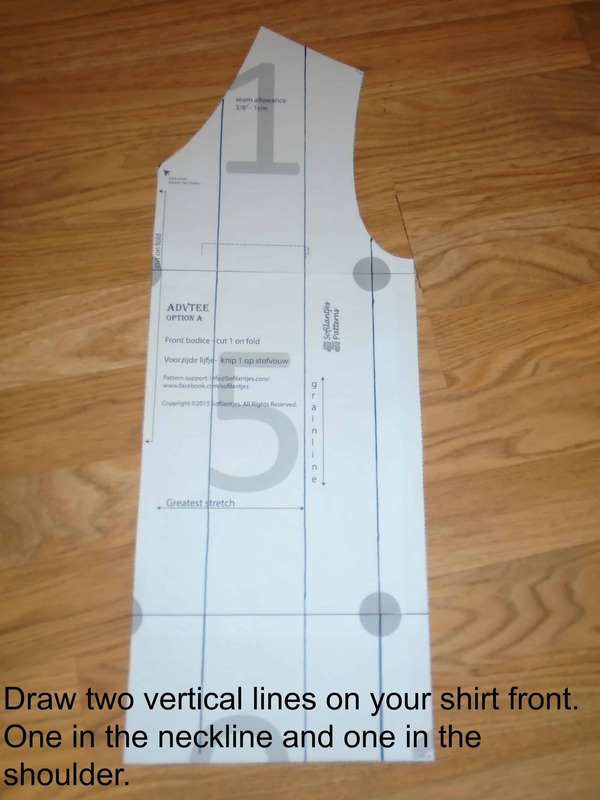 Cut out all your pattern pieces and sew according to the patterns directions. 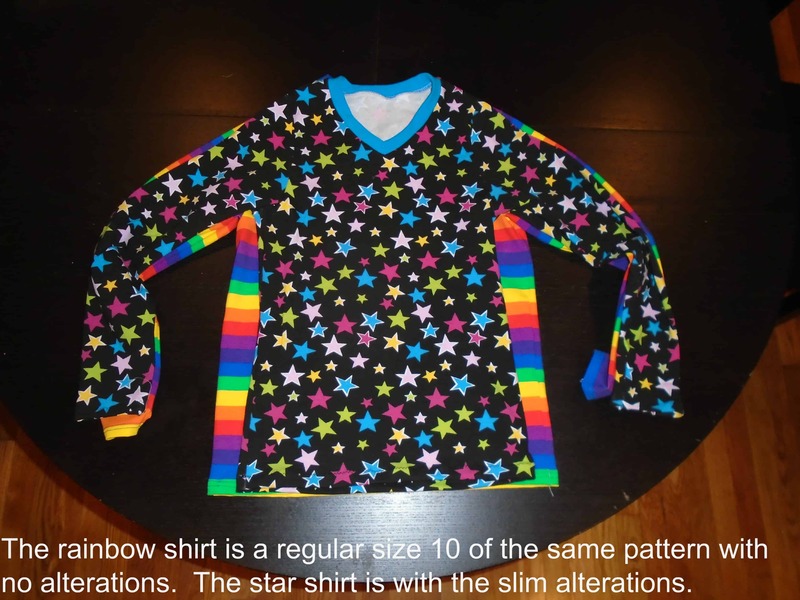 Here is a picture of my unaltered size 10 ADVTee (rainbow stripes) compared to my altered size 10 ADVTee (stars). As you can see the length of the pattern stayed exactly the same. As did the depth of the armholes and the depth of the v neck. The only thing that was altered was the width of the tee-shirt. There are lots of methods out there to alter patterns, but for children I find this to be the easiest one for me. If you are needing a plus size adjustment you can still follow the same methods I have shown. Instead of overlapping your pieces you will simply spread them apart to fit a larger width. I hope you have enjoyed my tutorial and will find it useful. Happy sewing everyone! Previous post: Who let the dogs out……..
Ik denk wel dat het slim is het armsgaten ook te doen, in de diepte – het kind is wellicht ook minder groot van “achter naar voren” gemeten, maar wellicht ook in de hoogte -als het ook dunnere armen heeft? Cool. My boys were always husky so I had to do the opposite. The opposite works to with this method. I’m still contemplating on how to adjust patterns to fit my eldest daughter. The youngest is quite easy, I only have to lenghten it one size for the moment. It looks so easy, but dont know if its as easy as it looks… I’m going to try it! Long arms and torso 🙂 I have one like that. I usually just add length to body and arms. With just one size difference I do that to.